In Sri Lanka, and in most other parts of the world, when massive development projects fail and lead to disaster, it is women who are most vulnerable to the resulting impacts. When they lose access to water, firewood, home gardens, farmland, livelihoods or social security, women and children suffer much more than men. This is why they need special safeguards and policy support in times of disasters. While there may be some policies in connection to natural disasters, it is man-made disasters, especially those resulting from failed development projects that are completely ignored by national policy. Let us bring attention to the plight of women due to man-made ‘development disasters’, and highlight the need to address this through policy. Kusumawathie had a small farmland where she used to plant vegetables for her family’s consumption. She sold any extra to make an income. Her husband Premarathne, a farmer and a petty businessman used to leave home early morning for work and return late at night. They lived in a mixed ethnic neighbourhood and were confident that their three daughters and their old mother were safe at home. They had water from a small well for domestic consumption and water springs to bring water to their farmland. This is when the Uma Oya diversion tunnel collapsed near their village in December 2014. The 22 kilometre long tunnel was designed to bring water from Uma Oya from the diversion point at Puhulpola to Kurundugolla where a 75MW power plant has been constructed. Kusumawathie and Premarathne immediately lost access to water. Their farm dried up and wasn’t able to grow crops. Due to the breakdown of the water aquifer, their house started sinking and the family had to vacate immediately. They moved to an urban area where they felt that their girl children were not safe, and so were forced to move back closer to their own village, where there was still no water. Today, they pay to rent a house and rely on a water bowser that delivers only 500 litres per 15 days. The entire family of six needs to use this water for cooking, bathing, toilets and sanitation and they are not able to meet their needs. Comparatively, a middle class person in the capital, Colombo, uses about 200 litres a day. There is no water for farming anymore. The family buys all vegetables from the market and has lost its farm income. This story is not unique. Over 4,000 families are facing the same situation along the 22 kilometre long Uma Oya tunnel. Most families had some farmland where they cultivated vegetables and flowers for their food needs and for earning a livelihood. Once the tunnel broke, 300 metres underneath a vast area of land went dry. The authorities were too slow to provide water, crop compensation, house compensation and livelihood opportunities. The farmers migrated to become labourers at construction sites in the cities. Women had no choice other than stay back and struggle to survive in broken houses. Such disasters, whether natural or man-made, have serious impacts on women because of the culture in Sri Lanka where women are solely responsible for house-care and childcare. They need to collect firewood, water, other home supplies, manage their home gardens, cook and some even school their children. Once they lose access to resources to meet their basic needs, life becomes very tough. Women are particularly vulnerable to sexual abuse in times of disasters as they may lose the security of their homes, may be alone without a male family member, there could be a breakdown of law and order, and overcrowded settlements. Women are more secure when they are among their own communities, neighbours and families. Development decisions are dominated by men, mostly elite politicians and bureaucrats. When new development projects are designed, developers don’t consider project feasibility or the cultural, social, environmental and gender impacts. They disregard women and children specific needs and don’tallocate adequate funds for rebuilding the lives of those affected by such infrastructure projects. Should policymakers not study impacts early on and calculate the external costs? Should they not consult women and communities before commissioning such projects? Should they not spend time thinking about alternative designs, better technologies, or resettlement plans in case of a disaster? Why should communities and women in particular bear the cost of development? Multilateral Development Banks (MDB) such as the Asian Development Bank or the World Bank has more focused women safeguard policies. Such MDB funded projects do identify women’s issues and put in place safeguards early on in the decision making process. However, Sri Lanka also receives loans from bilateral sources for infrastructure development and these do not have any gender sensitive safeguards. 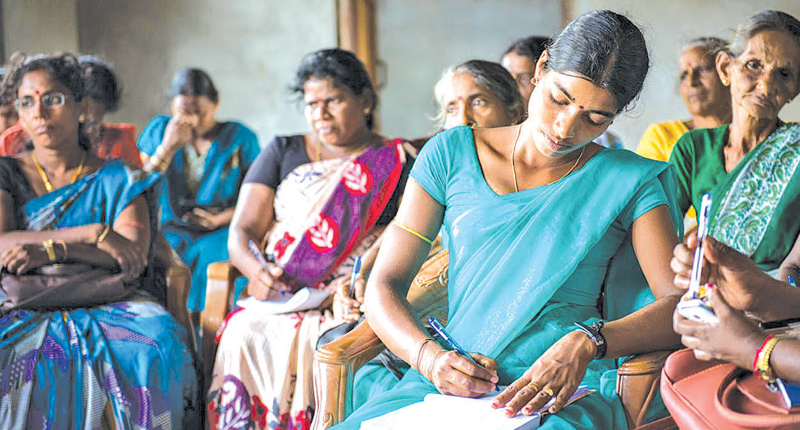 Sri Lanka too does not have a policy to address women specific issues in development projects. It’s time to provide such a policy to safeguard women against development led disasters in Sri Lanka.